The newfound black hole, first reported in the journal Physical Review Letters in June, has a mass about 49 times that of the sun. The collision that produced it released more power in an instant than is radiated by all the stars and galaxies in the universe at any moment. Findings from this and two previous discoveries of black hole mergers are providing the WSU scientists and colleagues at the Laser Interferometer Gravitational-Wave Observatory (LIGO) an unprecedented glimpse into the early universe and shedding new light on how binary black holes form. The researchers are using data from the three detections to subject Einstein’s theory of general relativity to increasingly stringent observational tests. So far, however, there is no indication that these events deviate from Einstein’s predictions. How do binary black holes form? 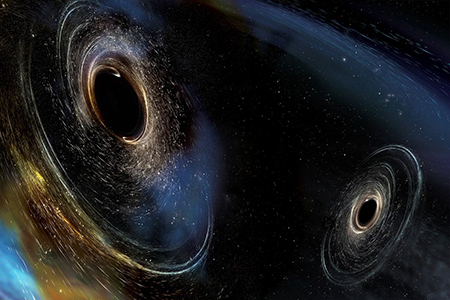 An artist rendering of two black holes merging, like the ones LIGO detected. Image courtesy of LIGO. LIGO’s latest findings provide clues about the directions in which the black holes were spinning before they collided. As pairs of black holes spiral together, heading towards a collision, they also spin on their own axes-like a pair of figure skaters spinning individually while also circling around each other. The LIGO team’s analysis suggests these spins were misaligned, indicating that the pair of black holes might not always have been together in a tight binary system but, rather, randomly came together over time. LIGO Laboratory operates two detector sites, one near Hanford, Wash., and another near Livingston, La. This photo shows the Hanford detector site. Scientists at WSU collaborated with members of the LIGO Scientific Collaboration to distinguish gravitational wave signals from noise artifacts. They contributed to the work of canceling out the other myriad noises picked up by the twin LIGO detectors in Hanford, Wash., and Livingston, La., that weren’t gravitational waves. LIGO’s detectors are designed to register the slightest of vibrations — 1/10,000th the diameter of a proton — caused by signals from space. But the devices also detect other disturbances triggered by such earthly events as trucks on a highway, earthquakes, explosions, lightning strikes and even waves crashing on the shore hundreds of miles away. Bose, Mazumder and Hall worked with other LIGO scientists to identify the frequencies of these disturbances. Akin to a giant set of noise-canceling headphones, their work helped researchers home in on deep space signals while blocking out everything else. Finding the exact location of the source of gravitational waves deep in space is challenging work. LIGO scientists were able to identify the wide patch of sky where the black hole merger took place but were unable to pinpoint its exact location. Bose is helping to develop a third LIGO detector in India that will provide the triangulation necessary to more precisely locate gravitational wave-producing objects in space. The new facility is expected to be operational by 2024. The first two detections of gravitational waves generated by the collision of two black holes were reported last year. They marked the end of a decades-long, multimillion dollar quest to find them and confirmed a major prediction of Albert Einstein’s 1915 general theory of relativity. 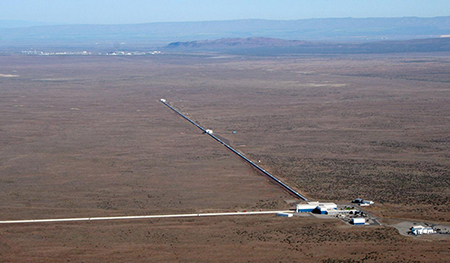 The LIGO Scientific Collaboration (LSC) is funded by the National Science Foundation and led by the California and Massachusetts Institutes of Technology. The LSC and the Virgo Collaboration in Europe made this discovery, and together consist of more than 1,000 scientists from around the world.